Only available at our Beaver Village location in downtown Winter Park. For those who want the experience of snowmobiling Colorado up to the Continental Divide at their own pace. Maps provided. Easy to follow trails. Largest open bowl play area in Grand County. You drive Ski Doo Trail Touring (1 or 2 person) machines with a 600cc 4-stroke engine. You must have at least two snowmobiles in your group to go out. 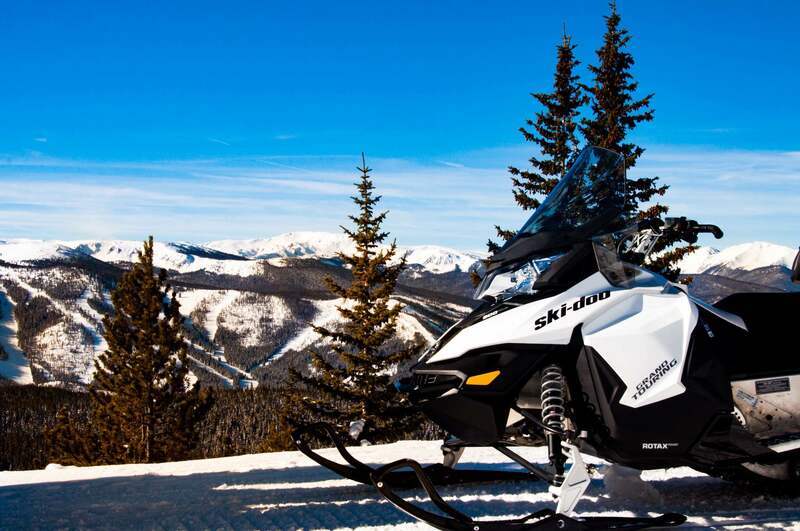 If you want to spend more time riding all the groomed Colorado snowmobiling trails in our area or exploring the vast back country of “un-groomed” trails and meadows, we offer Ski Doo Trail Touring (1 or 2 people) snowmobiles with a 600cc 4-stroke engine. You must have at least two snowmobiles in your group to go out. For those who want the experience of a guide on the Continental Divide tour and then return to the snow unguided that same day, we offer a 10% discount off each unguided rental machine. This allows riders to get acquainted with the snowmobiles and our trail system with a guide in the morning from Winter Park Mountain Lodge. You may choose to come in for either a break or lunch and then go back out again in the afternoon, unguided at our location in downtown Winter Park ( Beaver Village ). You do not have to reserve the unguided rental portion of the combo in advance if you are uncertain about four hours of Snowmobiling. Upon return from your tour, inquire at the front desk about the “combo discount” for your afternoon unguided rental. They will call the unguided location and check availability. However, on weekends and during busy times unguided machines may not be available without prior reservation. Combo discounts are only available on the same day and there is a 48 hour cancellation policy on all reservations.